“From the Rock and Roll Hall of Fame to Buckingham Palace, Ringo Starr is – finally – getting his due. “An excellent book – even for fans who do not play drums. It is explained very clearly which facts and how they are presented. 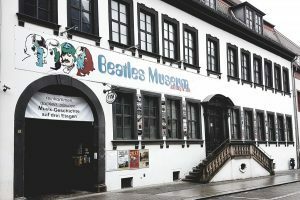 At the beginning it’s about the music scene of the 1950s and 1960s in and around Liverpool, as well as interesting things about the Cavern Club and the then music scene in Hamburg. The show (with interesting details) of the professional playing drummers for the Quarrymen or Beatles seems complete: Colin Hanton, Michael McCartney, Tommy Moore, Norman Chapman, Johnny “Hutch” Hutchinson, Pete Best and Ringo Starr. Also mentioned are three people who were temporarily sitting on the drums: Andy White, Jimmy Nicol … and Paul McCartney. For each song there is the following information: when recorded / in which bar played / which rhythm instruments were used / editorial short text. For each album is listed again additionally, which rhythm instruments were used. And the many photos and pictures! For that reason alone, because Ringo Starr is the subject of the book, he is also the center of almost all photos. “True Ringo fans rejoice! 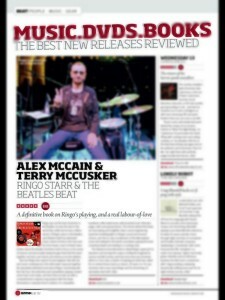 Sound engineer Alex Cain and scene-contemporary Terry McCusker have put together the absolutely definitive book about Ringo’s drumming with the Fab Four”……..
“A beautiful hardback coffee-table book, well presented over 400-plus pages, with some great photos.” “The stories behind the beats are fascinating and insightful…it’s absolutely vital stuff” …….. Rhythm Magazine, July 2017 edition. “At last a book about Ringo and drumming. The authors have both enjoyed careers as drummers, and with a foreword by Don Powell, (the drummer with glam rock band Slade), we have the ideal book for drummers and Ringo fans. 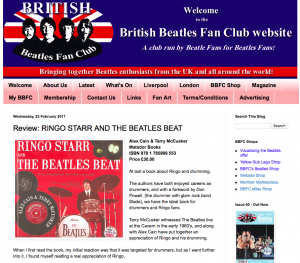 Terry McCusker witnessed The Beatles live at the Cavern in the early 1960’s, and along with Alex Cain have put together an appreciation of Ringo and his drumming. When I first read the book, my initial reaction was that it was targeted for drummers, but as I went further into it, I found myself reading a real appreciation of Ringo. The book begins with a section of how to use drum notation, and what the different parts of a drum kit are, followed by a short piece on Terry’s recollections of Merseybeat and The Cavern. The book then looks at some of the many drummers The Beatles had before Ringo came along, including Colin Hanton, Mike McCartney, Garston Bottle Works very own Tommy Moore, and, of course, Pete Best. A mini Ringo biography follows, before we look at the two drummers who played with The Beatles after Ringo had joined- Andy White, Jimmy Nicol and Paul McCartney. Ringo’s styles and kits are then analysed. I found the drum kits especially interesting. The book then looks at recording and the producers and engineers of The Beatles’ records, before we get to the nitty gritty of the book. Of the 400 pages, 262 look at The Beatles songs, with brief information of each song, and part of the drum notation, so if you own a drum kit, you can play along. When I got to this part, I was tempted to get a drum kit and try it out, but my room is too small! “I am not, and sadly never could be, a drummer. However I love the Beatles’ music and, having spotted this new book on a display stand at its publishers while I was there fixing the loo (! ), I thought it looked fascinating so I later bought a signed copy (direct from the authors on here incidentally – thanks very much chaps).The first two reviewers have covered the book perfectly, but it deserves all the praise they have given it and I just wanted to add another five star review to the collection. I won’t pretend to be able to understand the drumming notation given for the songs, but the details of Ringo’s life, his kit, his technique and how he fitted in to the group are also well worth buying it for. It’s a beautifully made book, heavy, striking and attractive to look at, and with excellent reproduction of the text and photographs. This is a weighty tome (2Kg) of exceptional quality. 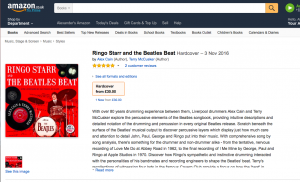 “This is a fabulous book, with a unique angle and fresh look at the Beatles music, examining Ringo’s work with the Beatles, and much, much more. The main section of the book looks at every Beatles song, and how the Beatles got the best out of Ringo’s drumming talent and used percussion to enhance the songs. The book includes notated drum music, and you can clearly see the layout of the percussion (tambourine, bongos, cowbell etc). It’s great to listen to the songs while following the music, and you don’t have to be a drummer or musician to do so. “Let me start off by saying that this book is the epitome of books on the subject of Ringo Starr and is absolutely full of information we have maybe heard briefly before but here before you is an in- depth exploration of a different kind and I feel richer for having bought the book and delved into its contents . Besides the obvious word content there is a plethora of brilliant photos, a great breakdown in the form of the drum chart but what is most unusual and pleasing to the eye is the very clever use of the pie chart for percentage use of the various instruments per Beatles track . 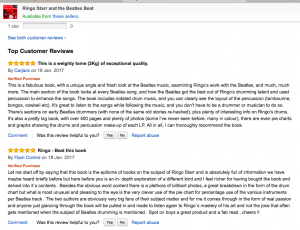 Modern Drummer Review of the ebook of Ringo Starr And The Beatles Beat. 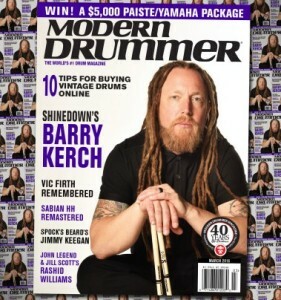 Jeff Potter, Modern Drummer, March 2016. The following reviews have been posted on various Kindle and iBooks stores worldwide. I loved this read. Being a drummer might influence this, and being a Beatle nut probably makes this worse, but this is an excellent book that isn’t full of all the same stories rehashed. Rings is a great drummer. Totally underrated, but loved by people who understand his drumming philosophy. 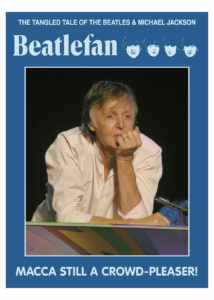 I stumbled upon this while looking for some Beatles drum sheet music. It’s an amazing review of Ringo’s work with the Beatles. A must purchase for any drummer interested in Beatles drumming and use of percussion. An absolutely brilliant book, even for non-drummers. A really good insight into the history of the Beatles thoroughly enjoyed it and would recommend it to anyone , bravo!! !